Dear CSCA Members, An amendment to the CSCA By-Laws was posted on the CSCA website on July 29, 2018. CSCA Pres. Earle P Wikle, will motion to withdraw proposed By-laws amendment. Below is the proposed amendment to be voted on at the CSCA Membership meeting. Current 4. Code of Conduct - Given the educational purpose of the Association, it is essential that a civil and sportsmanlike atmosphere exist at all events. Chess players and observers will treat each other, tournament directors, and event organizers with the utmost respect and will not engage in any form of un-sportsmanlike or uncivil conduct to include any form of behavior disruptive to the chess playing environment. Violation of this code is good cause for suspension or expulsion. Proposed Change 4. Code of Conduct - Given the educational purpose of the Association, it is essential that a civil and sportsmanlike atmosphere exist at all events, and on any social media for the CSCA. Chess players and observers will treat each other, tournament directors, and event organizers with the utmost respect and will not engage in any form of un-sportsmanlike or uncivil conduct to include any form of behavior disruptive to the chess playing environment. Violation of this code is good cause for suspension or expulsion. The CSCA Board met for a hearing on August 25, and went into a closed executive session; therefore, all parties are protected under executive order. The board determined Shirley Herman is not a current CSCA member; therefore, according to the CSCA By-Laws, cannot be considered for a suspension or expulsion. Appropriate parties will be notified. As a special treat for everyone, Fred Spell & Todd Bardwick have released a supplement issue of the CO Chess Informant "Bobby Fischer's Visits to Colorado"
Update: Minutes will be posted upon electronic approval by the board. 4. Code of Conduct - Given the educational purpose of the Association, it is essential that a civil and sportsmanlike atmosphere exist at all events. Chess players and observers will treat each other, tournament directors, and event organizers with the utmost respect and will not engage in any form of un-sportsmanlike or uncivil conduct to include any form of behavior disruptive to the chess playing environment. Violation of this code is good cause for suspension or expulsion. 4. Code of Conduct - Given the educational purpose of the Association, it is essential that a civil and sportsmanlike atmosphere exist at all events, and on any social media for the CSCA. Chess players and observers will treat each other, tournament directors, and event organizers with the utmost respect and will not engage in any form of un-sportsmanlike or uncivil conduct to include any form of behavior disruptive to the chess playing environment. Violation of this code is good cause for suspension or expulsion. As many people may know, there have been some changes to the CSCA board over the last couple of months. Apologies for the delay in reporting this information, but I am one of the ones affected in this scenario. James MacNeil has decided to step down as Member at Large to focus on the Denver Chess Club. Dean Clow has stepped down as President. Earl Wikle will assume the role of President until September. Dean stepped down for personal reasons that he doesn't want to get into at this point of time, and would like to thank everyone for their support. Congrats to Lior Lapid who once again won the Colorado Closed! Colorado Day of Champions this weekend! This weekend is the Day of Champions event down in Colorado Springs. This is a one day event, but featuring 3 separate tournaments! There is no need to get a room and all that expensive stuff for this tournament!. Come and join us and enjoy a day of Quick, Blitz, and Bughouse. There will be a CSCA board meeting on May 21st @ 7:30pm MST. This will be a remote meeting, so please join us from the comfort of your home OR join us in person at Club Chess!! in Colorado Springs, or Dean's Apartment (message deanrclow@gmail.com for address please). https://discord.gg/RtaXJvf - CSCA Channel (on the left side of the screen is where you swap this). Please make sure to have our microphone muted unless you have some relevant input. Colorado Closed Rounds 2 & 3 Today! Rounds 2 & 3 of the Colorado Closed will be streamed live today. 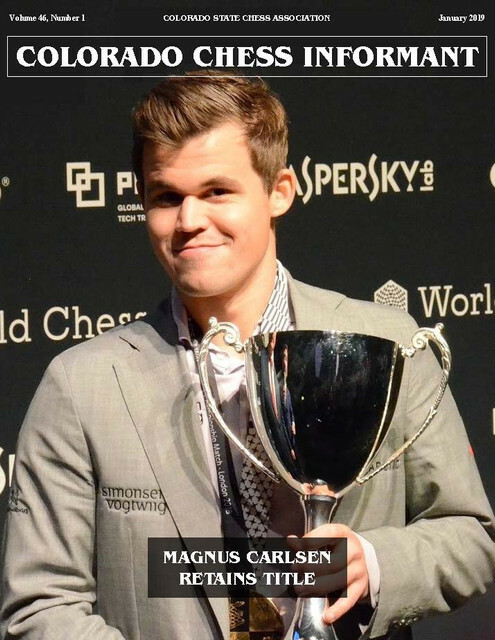 Please join us @ https://www.twitch.tv/coloradochess. Round 2 starts at 10am, Round 3 at 4pm. NOTE: The players decided to move Round 3 from the advertised 3pm to 4pm to allow more of a break. 22 players joined us this year for the Senior Championship at Club Chess!! in Colorado Springs. This marks a decent improvement over the previous year; Maybe due to the location change or the slight price reduction. The prize fund was also significantly increased over last year due to lower TD and venue fees, leaving the tournament with $485 in prizes. The application page for the Colorado Closed is now open for business. NOTE: Registering does not mean you are eligible. Only the top 6 players (or if you qualified last year) will be eligible for the tournament. The tournament is over! A big thank you to all the parents, TD's, players, and oraganizers that did their part to make this tournament a huge success! If anyone has pictures that they are willing to have posted on the website, please send them to deanrclow@gmail.com as we'll start a good montage of chess pictures! Day 1 of the CSCA Scholastic Championship is over at the MSU Tivoli Center. Some very good games today with the promise of tomorrow being even better! There will be a CSCA board meeting on Jan 29th @ 7pm MST. It was a good year for the CSCA with the board functioning like a well oiled machine. It was only necessary to have 3 meeting throughout the year, and also kept online contact to a minimum. Here are the list of motions that were passed this year: Most were unanimous, the exception-the membership vote to not accept the Board’s recommendation to kill the tour by 2 votes following a very lengthy speech in favor of continuing the tour by Buck.